Crystal Singing Bowl Sound Bath with Simon Emsley, PhD. A sound bath is a sound vibrational meditative and healing experience. 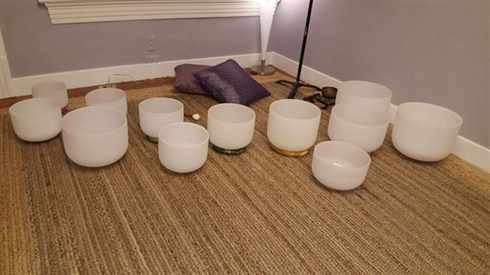 It is part meditation and part inward journey, our sound baths are healing musical performances played with Crystal singing bowls. You will be immersed in sound producing a deeply relaxed state, mentally, physically and emotionally. This sound journey “cleanses the soul”. To enjoy the experience you can sit in a chair or lie on the floor and let the waves of sound wash over you. Bring your yoga mat, blanket and pillow if you like. We encourage you to set an intention as to what you would like to receive from our time together, then lie or sit back and allow the tones and vibrations to bathe you into a relaxed and meditative state.